Ok, so that last Kickstarter project I put up was a bit of a last minute affair (that’s what we get for having me cover these instead of Matt, eh? ), so I’m making amends this time around. 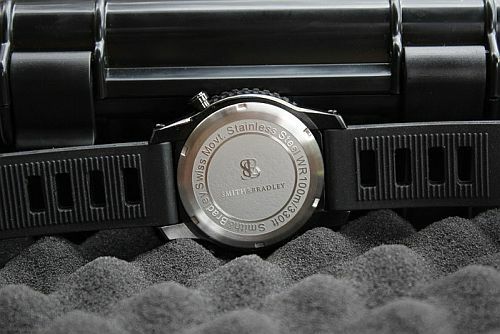 We’re giving you plenty of advance notice for the latest US-built watch on Kickstarter, the Smith and Bradley Ambush. 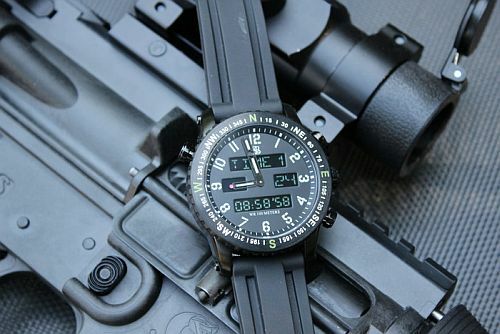 While we’ve seen a sports/diving watch in their Atlantis, they’re headed back more to the tactical roots that we saw with their Sans-13 model (speaking of, you can win one of those right here). This time around, they’re gone for something new for the brand – an analog-digital display. This, of course, is a popular feature for quite a few brands (say, Breitling or MTM). If they had stuck with a simple analog readout, the watch could likely have had a lot of the functions we have in the piece, but the digital readout really makes things easier to use. This is especially of importance to those who would be using this truly as designed – in law enforcement, for example. 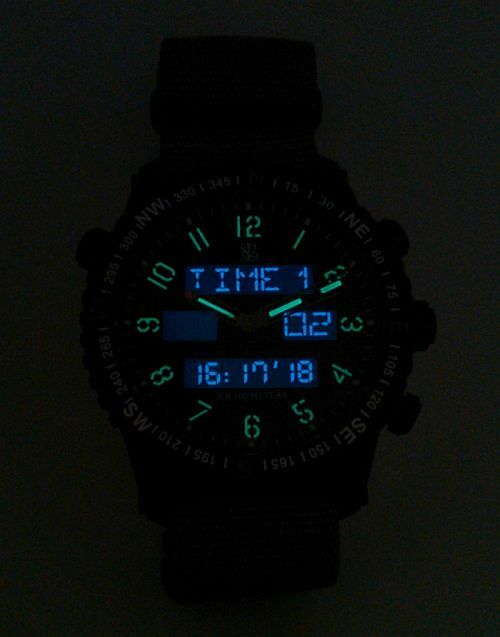 At first glance, the digital readout gives you a simple way to pick up a second time zone – or just read the time at night via the blue backlighting. So, why not just go full digital? Certainly, that would be an option, but then you’re into full-scale LCD design and manufacturing, and this is a simpler route to go – plus it’s a cleaner look. 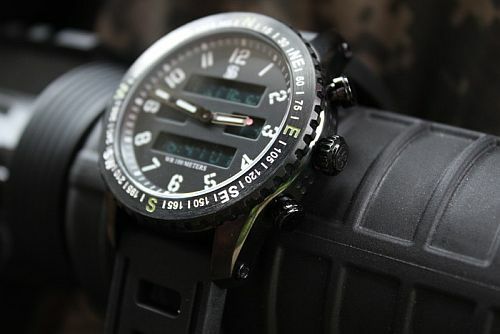 The analog hands also contain another bit of utility – when you put the watch into compass mode, the hands will indicate true north, while the digital readouts give you your current heading. Used in conjunction with the uni-directional bezel, you can orienteer pretty well, I’d imagine. 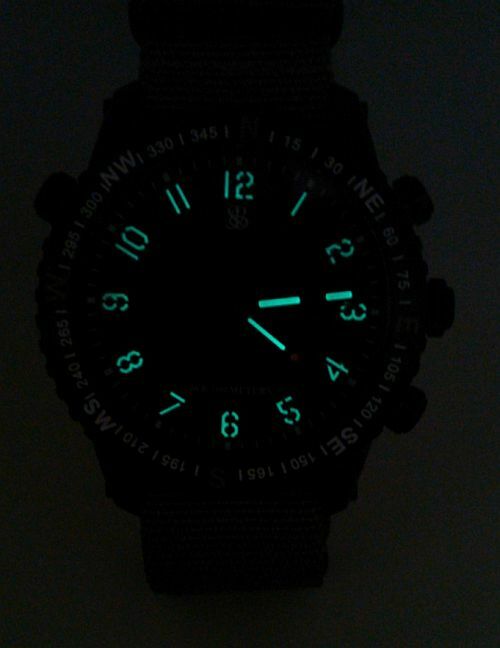 Yes, a standard watch can do something similar (by using the sun), but this is a much easier feature to use, as it’s implemented here. Would I buy one for myself based on what I’ve seen? : Hard to say – it’s an intriguing mix, and I like the brand. 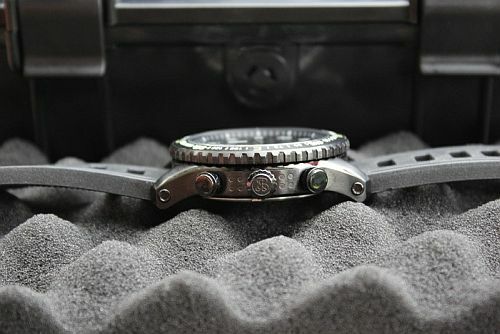 What spoke to me the most about this watch: The ana-digi combo, and the functionality that it enables.